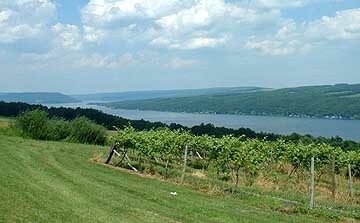 Vineyard on Keuka Lake:Notice Almost all the Finger Lakes have vineyards growing on their steep slopes. The climate and the drainage here is extremely favor- able for wine-making. 2. The Western Presbyterian Church at the Four Corners of Palmyra. It is also a reputed station on the Underground Railroad which followed the lakes. 2. Hill Cumorah is sacred ground for the Mormon Faith. It was here that Joseph Smith found the tablets that were used to write the Book of Mormon. 3. Canandaigua Lake is certainly one of the most beautful places in New York. 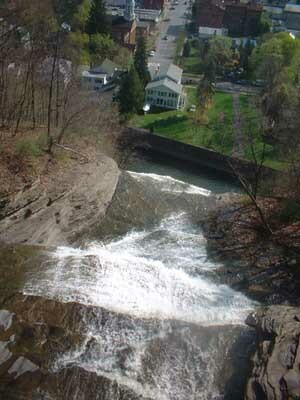 It sits in a very deep trough, typical of all the Finger Lakes. The hills in the distance are very important to the Seneca people. 4. Naples Moraine is found about two miles south of the village of Naples. Here the trough is partially filled with debris left over from the melting glaciers. 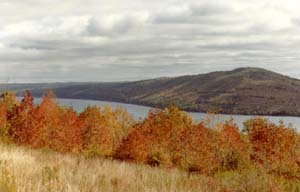 This moraine divides the drainage, forcing the Finger Lakes to empty to the north and on to Lake Ontario. 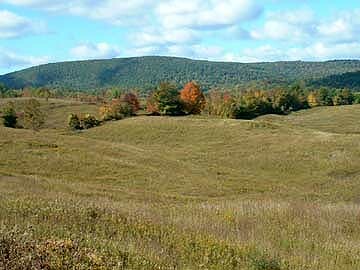 Nearly all of New York State was covered by glaciers during the last two ice ages, except for a small section in the southwestern part of the state (Allegany State Park). 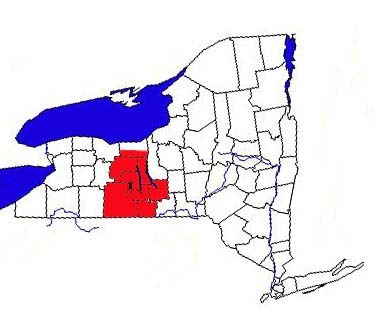 So, New York can be considered to be a laboratory of glaciated landscapes, with the Finger Lakes leading the way. There are no other lakes in the world that have the exact same characteristics. They lie in a series of north-south trending troughs, deep valleys with steep sides and flat bottoms. North of the lakes the gentle landscape is dotted with drumlins, thousands of them. As you travel southward, the terrain around the lakes gets higher and steeper. This is wine country. It is there that you also find the famous gorges of New York: Watkins Glen, Taughnnock Falls, Ithaca Falls, and many more. These tributary streams were left "hanging" after the Ice Age, and they carved a series of scenic waterfalls on their way down to the trough bottoms. The troughs themselves continue farther south beyond the lakes, but all the Finger Lakes drain to the north into Lake Ontario. They can't flow southward because a wall of rock and dirt, known as the Valley Heads Moraine, blocks the way. Beyond the moraine, the drainage pattern is south into Pennsylvania via the Susquehanna River. The valley bottoms here are very flat, filled with debris, or outwash, from the melting glaciers. The glacial pattern of the Finger Lakes is fairly consistent no matter how you travel from Lake Ontario south: Rte. 21 (Canandaigua Lake), Rte. 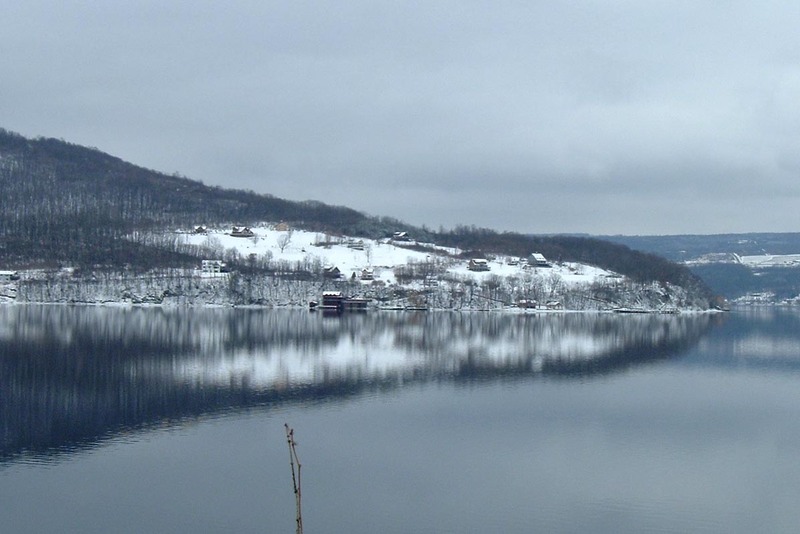 14 (Seneca Lake), Rte. 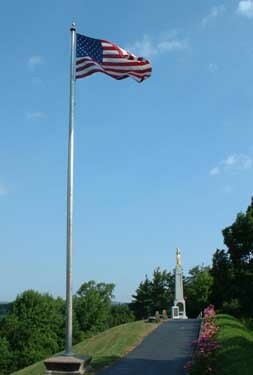 53 (Keuka Lake - photo at the top of the page), Rte. 89 (Cayuga Lake), or Rte. 41 (Skaneateles Lake). First you pass through the great drumlin field, and then you cross over the Erie Canal. Drumlins thin out before you enter the troughs. The topography gets steeper, and there are evidences of gorges and glens everywhere. South of the lakes, the troughs continue. You pass up and over the Valley Heads Moraine (see photo on the right, from just south of Naples, NY), with its "hummocky" (roller-coaster) terrain. Finally, you travel through the outwash plain as you enter the Susquehanna Watershed. You drive through some very fertile farm land, wedged in between the walls of the forested troughs. There is a common theme, but that is not to say that the individual lakes are carbon copies of each other. 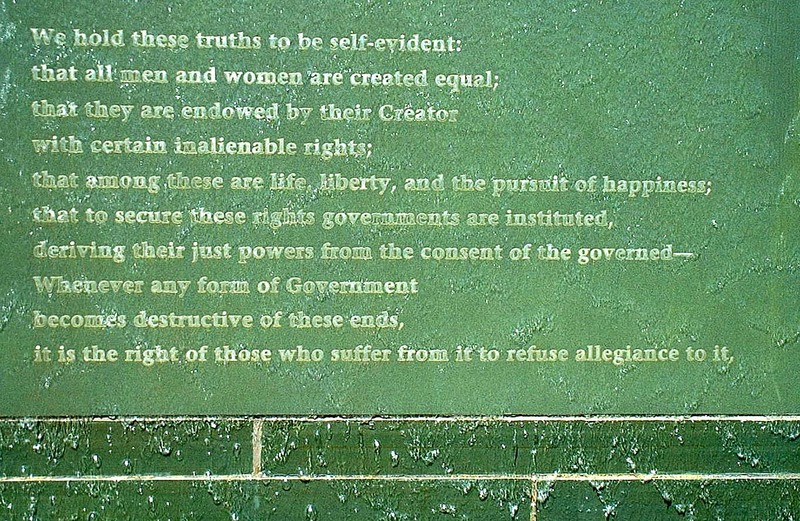 They are each worthy of your geographic attention in their own right. How you travel through the Finger Lakes Region is not important. You can concentrate on one lake at a time, or you can zig-zag across the region, if you don't have the time for a more lengthy visit. To avoid confusion, the sites are clustered by the three of the major north-south routes listed in the previous paragraph. 1. The little hamlet of Pultneyville sits on the shore of Lake Ontario, so it is included in the Seaway section. As you begin your drive south notice the two most significant geographic features. First, the drumlins, aligned roughly north to south, with the north side being the steeper. They are usually shaped like upside-down teaspoons. Second, you will see the apple orchards, which are very common in the microclimate near the Great Lakes. In Marion, you will see the Seneca Mott factory, which produces fruit products (juice, applesauce). Off to the right, if you look carefully you will see some housing that look like barracks. They house the seasonal workers. QUESTION: Why are the workers only seasonal? What do they do the rest of the year? How does that impact the economy of apple country? 2. Just a few miles south of Marion, you will cross the modernized Erie Canal and enter the village of Palmyra. This is one of many Finger Lakes villages that owes its existence to the canal. It has a very interesting geographic claim to fame. 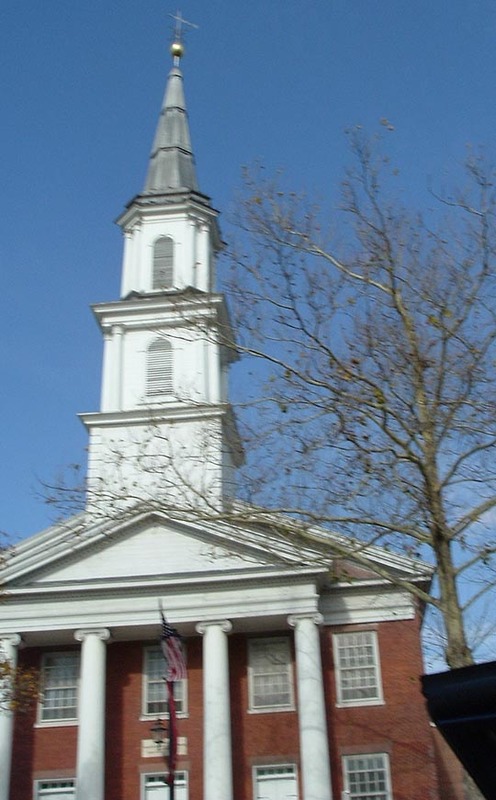 At the main intersection of downtown Palmyra, where Route 21 takes a turn to the left, there are churches on each of the four corners, a trait is unique to Palmyra. QUESTION: Why wouldn't you normally find churches on every corner of a village business district? As you leave town, you travel through more farm country. Do you still see orchards, or has another kind of agriculture taken hold? Soon you will reach one of the landmarks of the Finger Lakes, Hill Cumorah. This is the place where Joseph Smith found the tablets that he used to write the Book of Mormon. To commemorate the founding of the Church of Latter Day Saints, a pageant is held on the hillside in late-July. The hill itself is a drumlin, and the view from the top gives you a great layout of the countryside. 3. Continue driving south to the village of Canandaigua, which sits on the north end of the lake of the same name. Now you should notice strong evidence of the backbone of the Finger Lakes economy, tourism. Much of it is concentrated by the lake, but a visit to Sonnenberg Gardens is definitely worth your time. It boasts an impressive Victorian mansion, and a wide variety of gardens. In the last few years, the gardens hold a Haunted House in October and a beautiful light display at Christmas time. QUESTION: Why did the management of Sonnenberg make the decision to expand the season? The state recently took over management of the estate. Was this a smart move or not? As Route 21 continues southward, it climbs up the wall of the trough, with great views of Canandaigua Lake. (see the photo at the right). Vineyards and vacation homes are ubiquitous. You will drop back into the valley, as you reach the south end of the lake. A wetland surrounds you. QUESTION: This is an indication that the lake was once larger than it is now. Why is that so? 4. Soon you will enter the village of Naples, the self-proclaimed "Switzerland of America." It boasts a large winery, and is the focal point of a Finger Lakes cottage industry, the grape pies. QUESTION: Do you think this nickname is justified? What geologic history do both places share? Naples is also heavily dependent on tourism, especially in the fall, when the foliage can be spectacular. Outside the village is Grimes Gulch Park. This is the first of many glens or gorges you can visit on your journey through the lake country. Remember that this tributary stream is a "hanging valley", since its source is found on top of the trough, so it "hangs" above the main valley. As you continue your trip, you climb up a hill. It's not the trough itself, but a section of the Valley Heads moraine (see photo above). It will be hummocky at first, but eventually it flattens out around North Cohocton. You are now on the outwash plain. And you have crossed a divide separating the drainage north toward the lake from the drainage south to the Cohocton River. QUESTION: Did you notice the divide? Probably not. Do you understand why this is called a through valley? How far do you have to travel before you notice streams flowing south?